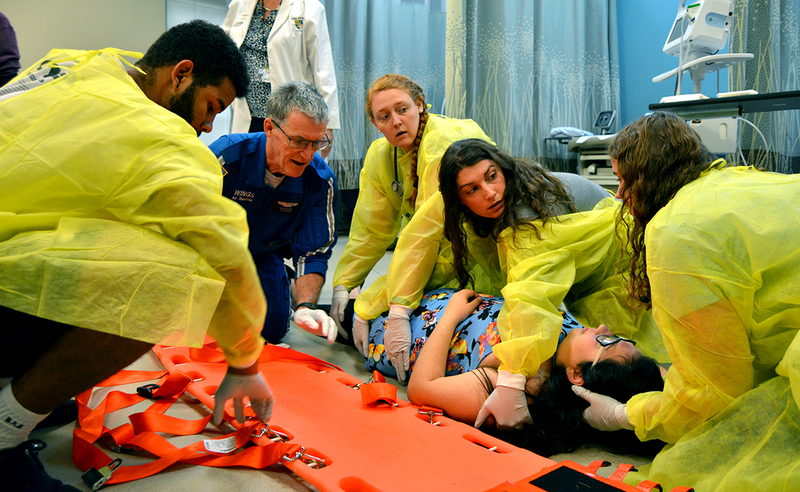 In its third year running, the May School of Nursing and Health Sciences mock emergency simulation prepares students for the worst-case scenario. This year, however, it wasn’t only nursing students that had to respond at the drop of a hat, the Criminal Justice students standing in as investigators and officers also had to spread their wings. Experience the one-of-a-kind simulation and see why a Lees-McRae education is unlike any other. Director of Theatre Arts, Danielle Curtis, works with students to apply prosthetic wounds, stage blood, and “rubber glass”—a silicone-based rubber product developed specifically for special effects. Mixed together the day before and left to cure overnight, the end result is a solid water-clear rubber that can be easily broken, shattered and crumbled to look exactly like broken glass. Most, if not all the victims sustained wounds from the car’s shattered windows making it a critical detail during preparation. 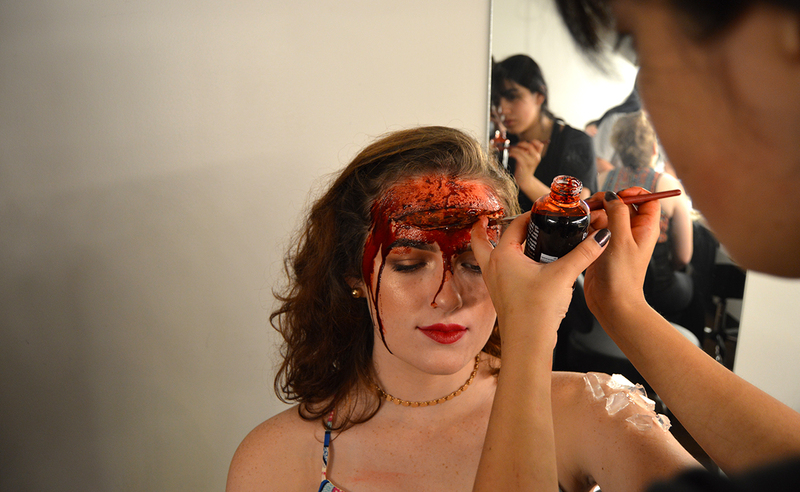 Alice Gomez ’20 assists Curtis in applying special effects makeup and stage blood to the actors in the Hayes Auditorium and Broyhill Theatre dressing rooms. The brightly-lit room was filled with laughter and lighthearted show tunes as students perfected their makeup both for one another and in the mirrors. 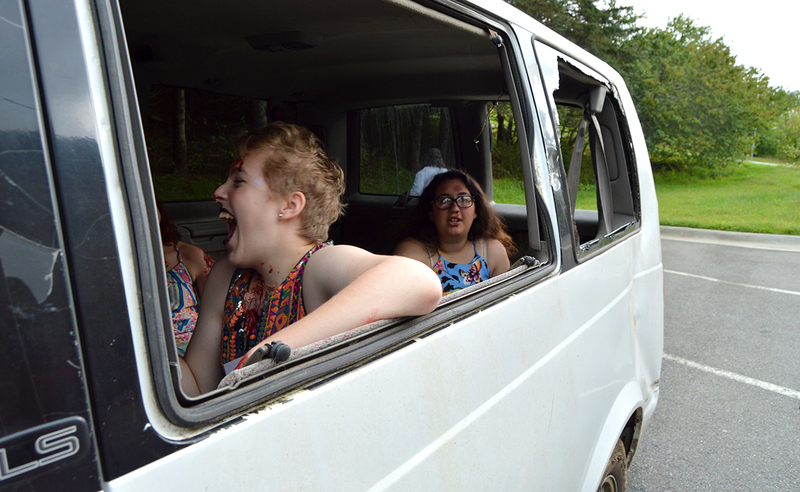 Located in the rear of the May School of Nursing and Health Sciences building, the Theatre Arts students take their places in and around the mangled vehicle. 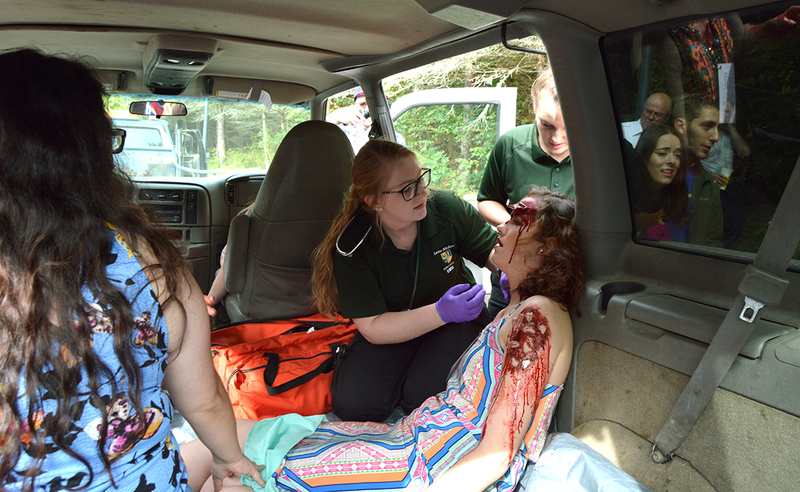 For this year's scenario, both nursing and criminal justice students responded to the scene of a drunk-driving accident. The car used in the simulation was a real vehicle recently involved in a wreck. 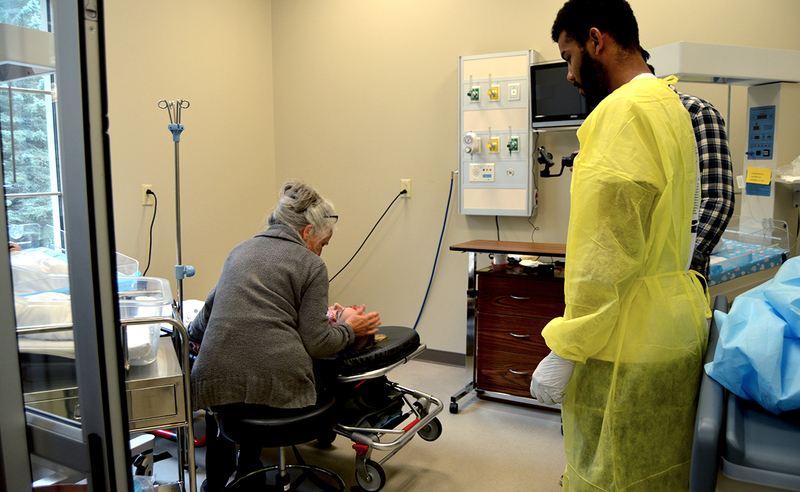 Once notified of the surprise simulation, nursing students spring into action assessing victims. 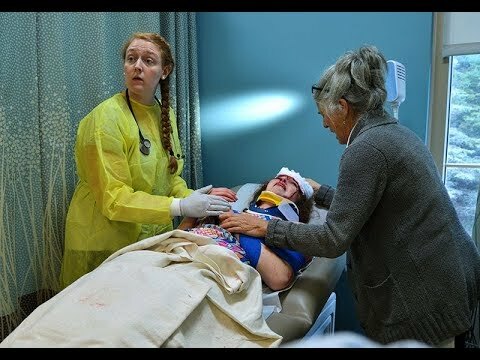 Though the trauma may be simulated, both actors and nursing students treated the event as if it were real. “Help me!” one victim cried out. “I’m going to help you, ok? We are going to give you the best care we can,” one nursing student replied. At the same time, criminal justice students work diligently to secure the scene. Alongside members of the Banner Elk Police Dept., students began taking witness accounts and recording information all in the hopes of determining the cause of the accident. Though faculty, staff, and actors were aware that drinking and driving were to blame, the criminal justice students were tasked to determine the cause. 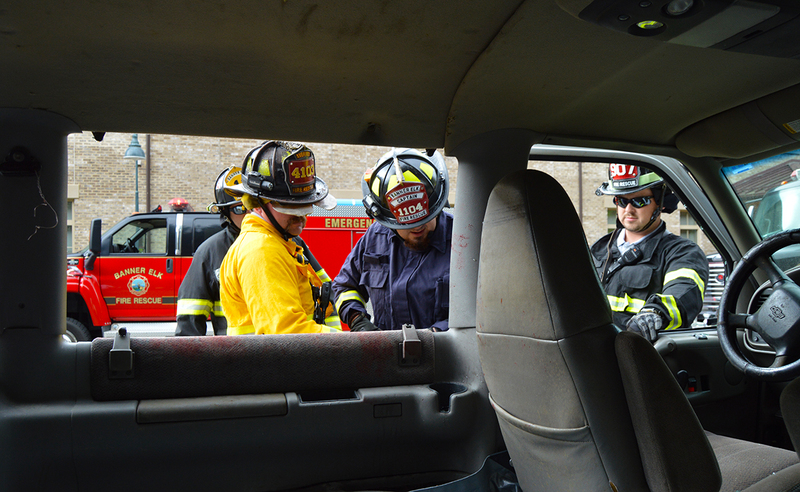 Members of the Banner Elk Fire Department use the simulation as an opportunity to practice as well. In the upstairs emergency room, nursing students work quickly with help from Wings Air Rescue paramedics to secure, transport, and treat a patient in critical need. Quickly, but thoroughly, students were taught how to safely load a patient onto the transfer board. 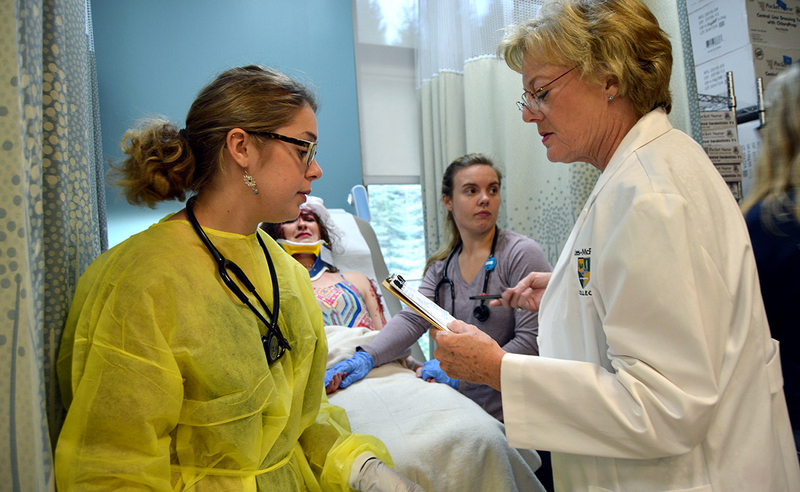 A student consults with Director of RN to BSN Claire Cline to see if her patient will need an emergency surgery. In some cases, students worked closely with faculty, but in many others, faculty stood back allowing the students to learn and make critical choices on their own. A tough reality, students share news with the “mother” of a patient who died due to injuries caused by the accident. Community volunteers, who in a few cases were nurses themselves, played the parts of distressed and emotional family members. “Even during a mock emergency simulation, sharing the news to a “family member” was harder than I imagined,” one student said. 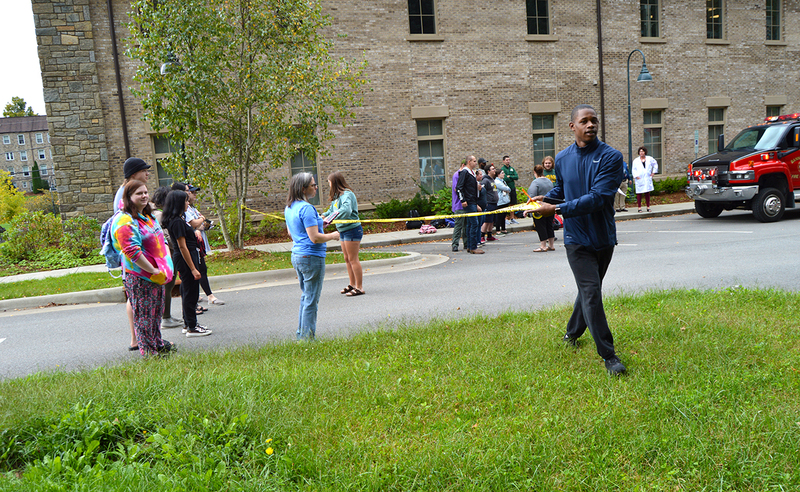 Learn more about academic programming at Lees-McRae. Want to see more? Check out this video of the students in action.